One of the new trends that Sike llc. 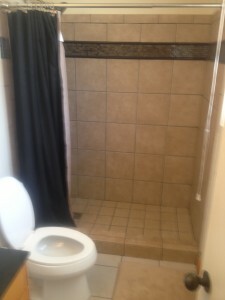 has been seeing is a need for ADA bathroom remodels for many homes in the island. Our aging kapuna are getting older and less mobile and need modifications done to showers, access to toilets, and sinks as they become less agile. We have been working on a few of these modification around Kauai, and here is one of the older homes we recently did. Opening up this shower and removing the curb in the shower added access for the our client’s wheel chair for easier access to take showers. © 2019 SIKELLC. | E-mail: Matt@Sikellc.com | 808.230.0480 | BC-31737 | All Rights Reserved.